The meeting point of the Seattle Bites Food Tours was at the Seattle Art Museum. We initially thought it was kind of odd meeting one block away from the Pike Place Market. It was later then we realized what a perfect place to start off the food tours. 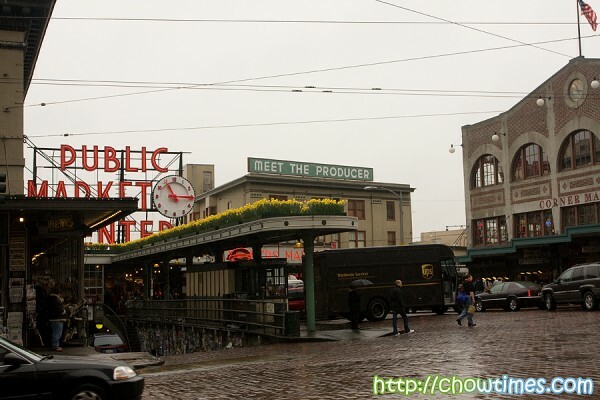 Yesterday, I blogged about the historical aspect of the Pike Place market. Today it is about the many type of food we sampled on the tour. There were altogether seven major stops we made. This is what Suanne and I had always enjoyed … not just tasting the food but also learning about the stories behind the food, the people and the place. We met at the informal public seating area just outside the TASTE Restaurant at about 10AM. We were specifically told by Jan Marie to come hungry and to even try to hold off our coffee fix at TASTE — we love this kind of instructions! So, we did not have a bite at all and even not have a sip of the free coffee in the hotel room. 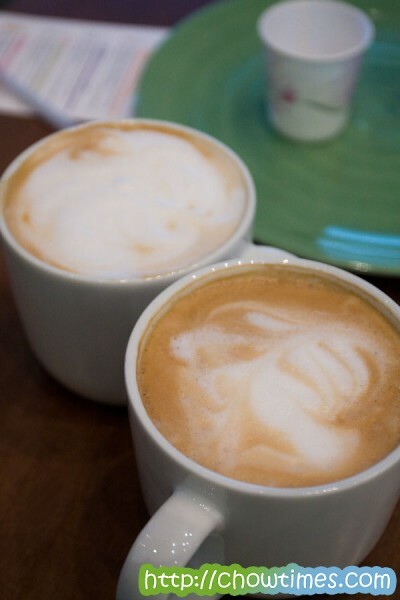 It was a good start … we had a nice hot cup of latte and capp. Some of you remembered that the north west had a freak snowy day on April 1st this year. That morning was cold and wet and so it was a real welcome to have a hot cup of freshly brewed drink in hand. 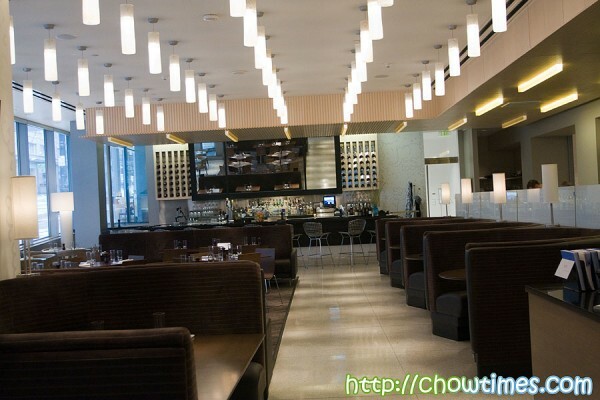 From the looks of it, TASTE looks just like any contemporary west coast style restaurants. We learned a lot of this restaurant in the tour here as this is no ordinary restaurant. 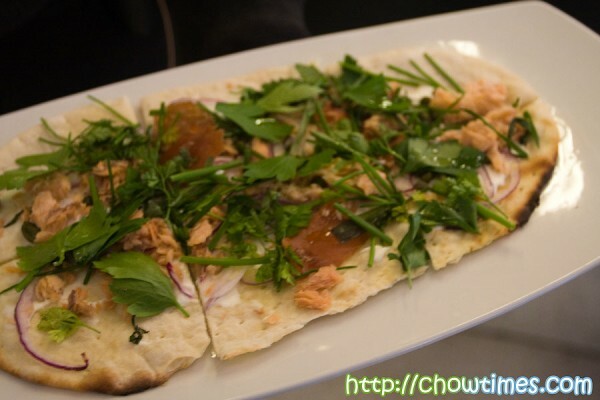 We were treated to the Smoked Salmon Flatbread. 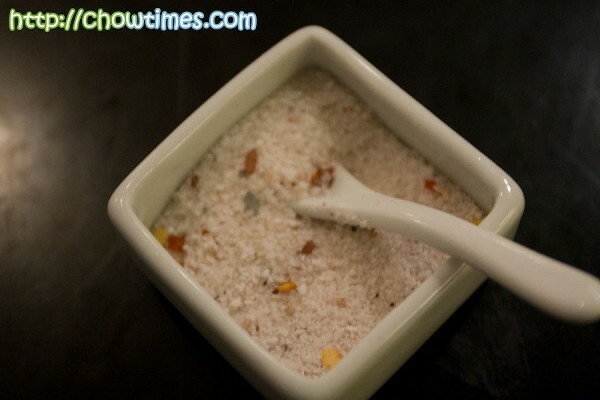 This simple but absolutely delicious item is created by the chef of TASTE with local ingredients. I first started off with just one piece but it was so good that Suanne and I ended up finishing the entire plate. The amazing thing behind TASTE is that the people behind the food actually personally go to the farms and learn about how the food was grown. They had to work the combines in harvesting the wheat so that they have a better understanding of how their ingredients are produced. They even had to experience the catching of salmon. They work closely with the source of their farmers and fishermen. I was very impressed with the seriousness they take to provide the best. On every table in TASTE, you will not see ordinary condiments. They are heavily into making sure everything is organic. But what they had on the table is their very own Signature Salt. It was good … not too salty but infused with lots of flavours. We can catch some cinnamon but am not sure what else is there. You got to try this one. Next time we are in Seattle, we will definitely come here for dinner. Crepe de France was our next stop. 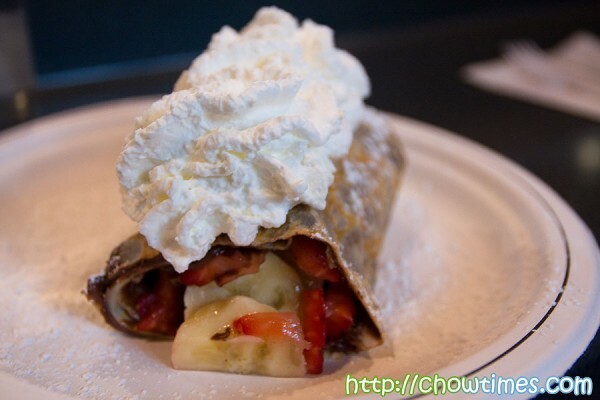 Crepe de France started off as a small stall at the entrance of Pike Place Market way back in 1991. It was only three years ago, they moved into this much bigger lot. 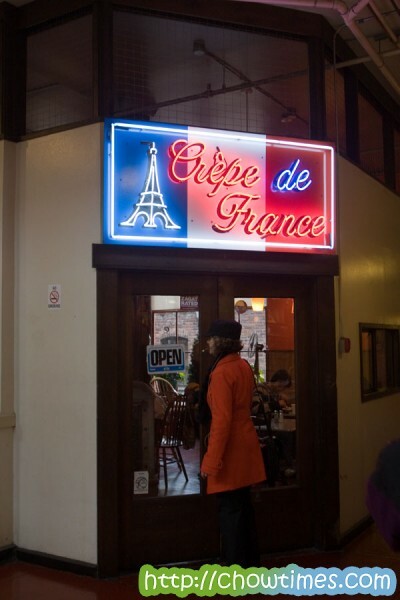 Crepe de France is very much a family restaurant. They went to Paris to learn the art of making crepes from the city that is famous for crepes. I remembered the excellent crepes I had when I was in Paris (see here). All the people we met on the food tour are such friendly and genuine people. We got to chat with Michael who was telling us about his first vacation to Vegas — he is a funny young man. We had Nutella Chocolate Crepes. It was awesome and yummy — especially when we had followed Jan Marie’s advice to come hungry. We sat by the counter overlooking the kitchen area and listening to Michael’s tales. We enjoyed ourselves a lot. They make all kinds of crepes. One day we will return and try their specials, like goat cheese crepes! When you are there in Crepe de France and feel adventurous, ask Michael (or Nani, his mum) for these specials. One thing I fail to mention earlier (and I did not have photos of this) … in every place we stopped at we were given drinks that goes well with the choice of food. Most of them are Dry Soda with lots of uncommon flavours like celery, kumquat, lavender, lemon grass, rhubarb, etc. We were served Dr Brown Cel-Ray here — a popular pop in New York. 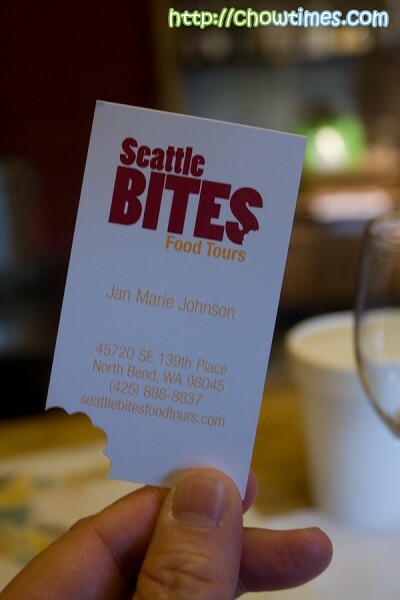 This is a complementary tour from Seattle Bites Food Tours. We had been to the Pike Place Market for so many times we have actually lost count. After a first two visits we thought we had seen everything. When I told a friend that we’re going to the Pike Place Market (again! ), I remember him telling me that the place is so boring, nothing to see and do. This time it is different. This time we were there for a purpose … to learn, to experience and to chow! I can’t think of anyone who had been to Seattle and had not visited the Pike Place Market. After all, this place is the oldest farmer’s market in the US and is considered the mother of all public markets. I am going to do this story in two parts. 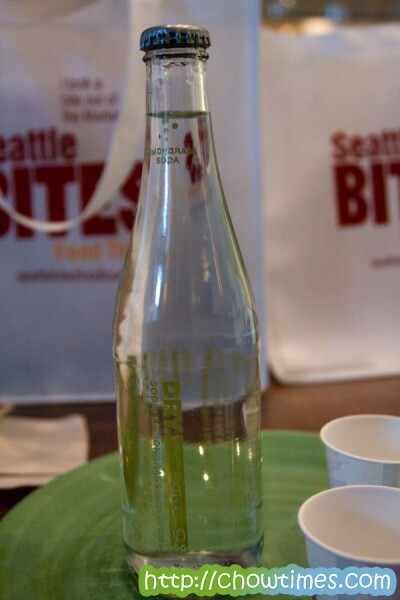 Today, I am going to share with you a little about what we learned at the Pike Place Market. I am going to also describe the Seattle Bites Food Tour. Tomorrow, it will be all about the food at the Pike Place Market … awesome food, and lots of it too. 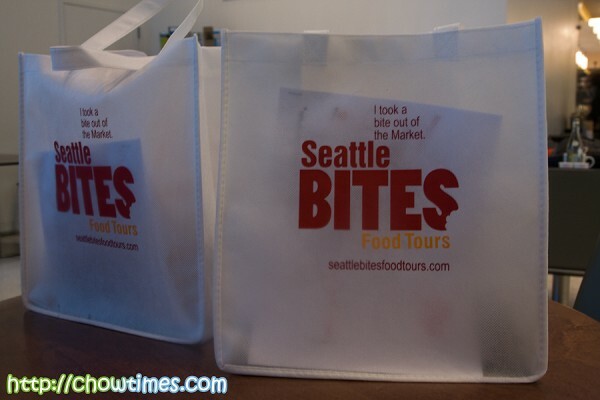 We had an invite from the Seattle Bites Food Tours to experience the Pike Place Market in a way that is not possible if you are there on your own. When we got the invite we jumped on it. It so happened too that I had to clear my vacation days (which had ballooned to over six weeks). We went with the primary expectation of tasting the food. What we encountered was beyond our expectations. 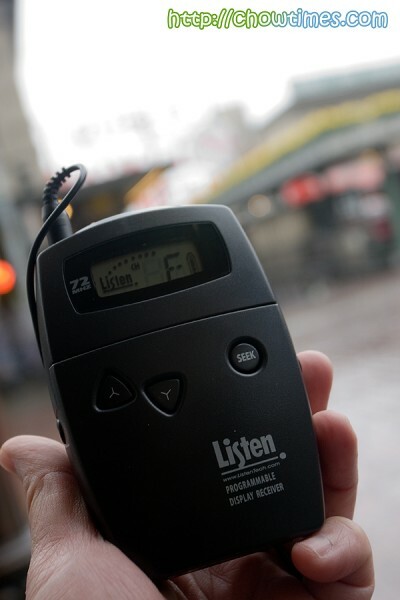 Not only is this a walking food tour but it is also a historical journey of the Pike Place Market. 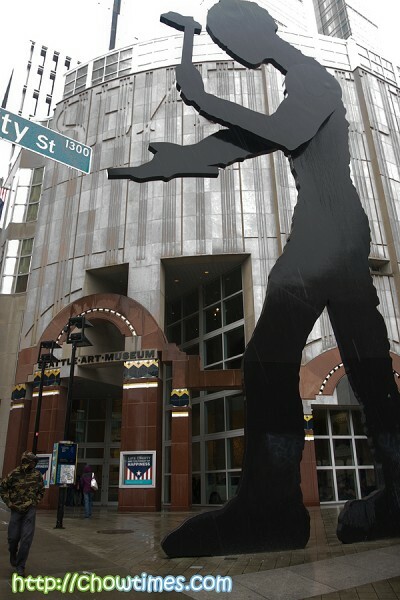 The meeting point was at the Seattle Art Museum which is located one block from Pike Place Market. We met Jan Marie Johnson who was our guide for the tour. She is very familiar with the market and knows the merchants very well. We had a little tour of the Seattle Art Museum where Jan Marie pointed out to us many interesting facts and historical buildings around the Art Museum. Suanne and I were given personal listening devices. It was particularly useful when walking through the din in the market. What I like is that this allows me to roam away to have a closer look at other stores while at the same time keeping in touch with what is being said. We were also issued shopping bags in the event we wanted to buy anything from the market or from the places we went to. 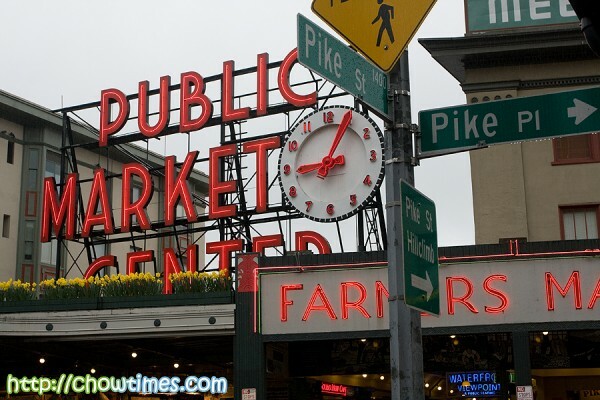 The history of the Pike Place Market started way back in the early 1900’s. You know where the exact place where it all began? It was at where the UPS truck you see above. Jan went on to describe (illustrated with old photos) of the early days — I felt that I was there! Throughout the entire 2.5 to 3 hour tour, Jan Marie brought us through starting with the events leading to the founding of the public market, to the depression era, the expansion years, World War II, the near demolition of the place and to the modern day. It is today a flourishing public market like no other. 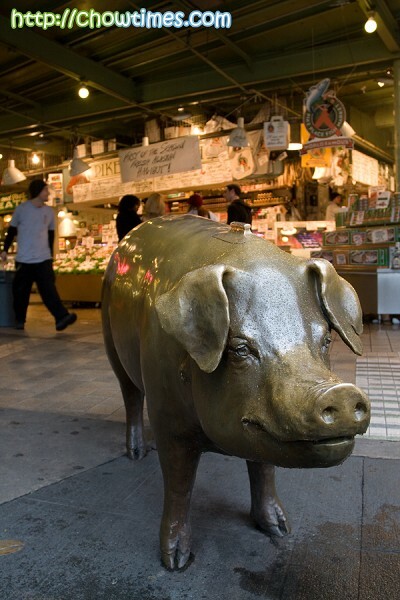 We had always wonder about the bronze pig at the entrance of the Pike Place Market. This is Rachel and it’s a real piggy bank. This piggy bank has in it just about every kind of currency in the world. As much as we had always wanted to make a visit to Pam’s Kitchen, for various reasons we had not. Pam’s Kitchen had always been on our list of to-visit places in Seattle. This time we made it a point to make Pam’s Kitchen our priority. 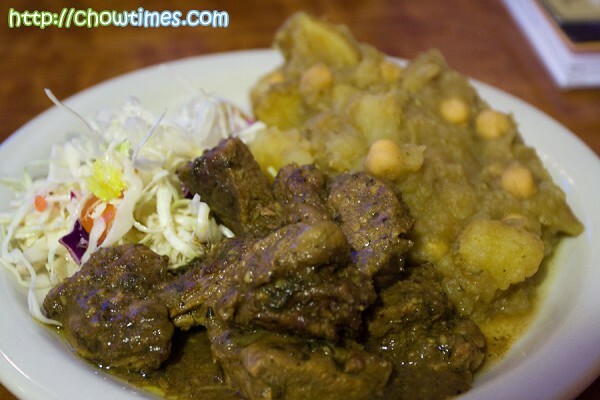 Pam’s Kitchen is known for their Rotis from Trinidad and Tobago. 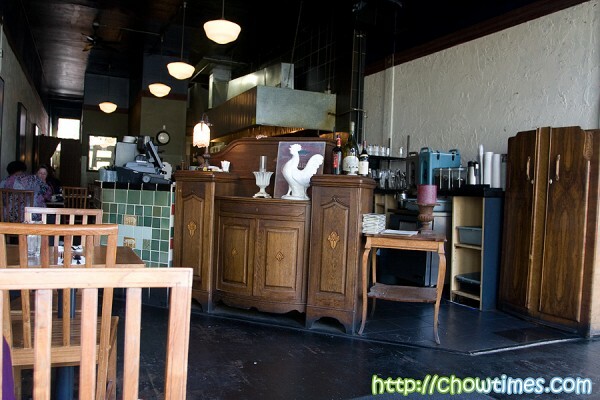 Pam’s Kitchen is located in the intersection of University Way and NE 50 Street in Seattle. Along this row are actually a lot of hole-in-the-wall type of eateries of almost every major cuisine. We counted among others Filipino, Chinese, Greek, Hawaiian, Japanese, East Indian, Pizzas. All of them looked very good from the outside. Walking into Pams’ Kitchen, there were an unmistaken (and somewhat overpowering) aroma of spices and curry. Service was very quick and friendly. They gave us two tall glass of water the moment we got settled. 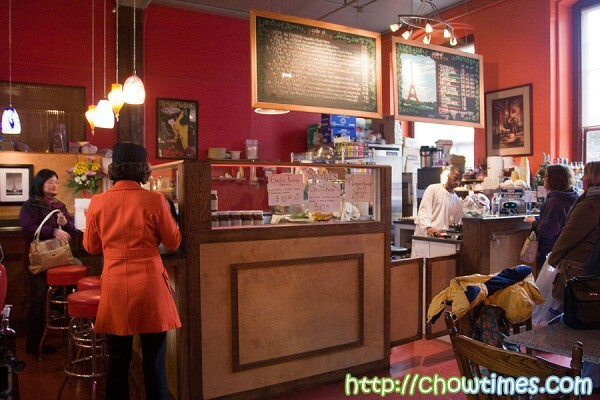 The place was not very big and we can see around us that their customers looked like students mainly. Definitely no families here that night. Strangely, we noticed a rather prominent sign hung from the ceiling that says “We reserve the right to refuse service to anyone”. We wondered what that sign was all about and if they have rather rowdy customers here before. They have rather unique drinks. Suanne had the Peanut Punch (Milk Base) which costs $3.75. This is not like anything we ever drank before. It tastes like watered down peanut drink with milk. It actually tastes like peanut butter. Am thinking that perhaps one could make this by blending a few spoonful of peanut better with milk. We like this. For me, I had the Sorrel which is described as Caribbean Hibiscus Petals, spiced boiled and sugar sweetened. It has an obvious floral taste and smell to it. 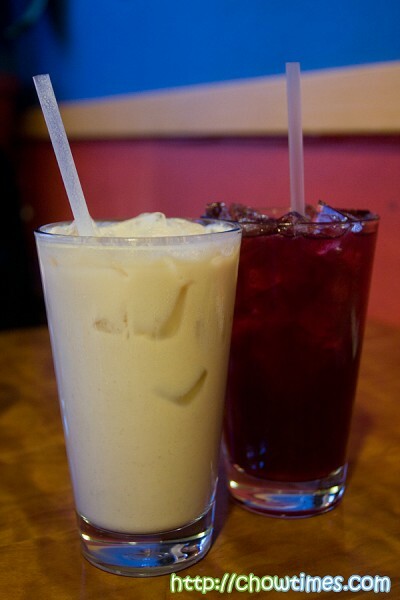 It is also kind of like chai tea with herbs and spices. We find the taste quite unique and yet familiar. Although it is described as sweetened, it is also a bit sourish. $3.50. The drinks were a great start to the main meal. Decide on either Paratha or Dahlpuri. Suanne chosed the combination of lamb and paratha. The lamb was spicy but not very hot. Meat was tender to the bite. It was very well made and flushed with flavour. The drawback was that it was rather dry’ish and that we wished they had more curry sauce to dunk the roti with. We also liked the mash potato and chick pea server on the side … it looked deceptively mild but was spicy hot. Nice. I read from the menu saying that they hand wash all the meats thoroughly with lemon juice. Here is a short series of our overnight trip to Seattle. I had a week off work and since we had an invite to do a review at the Seattle’s Pike Market, we thought we might as well make the most of it and go on a mini culinary journey of sorts there. 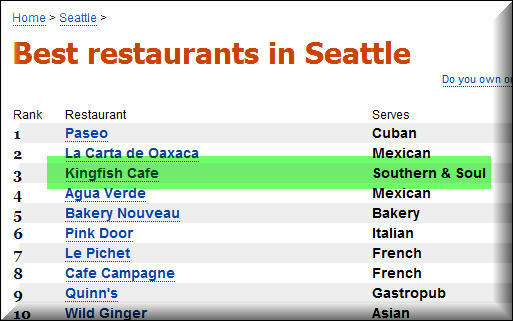 We did our selection of restaurants solely through Urbanspoon for Best Restaurants in Seattle. We figured we could not go wrong there. #1 was Paseo which we had visited before and blogged about it too. Suanne and I don’t fancy Mexican which rules #2 La Carta de Oaxaca out as a choice. 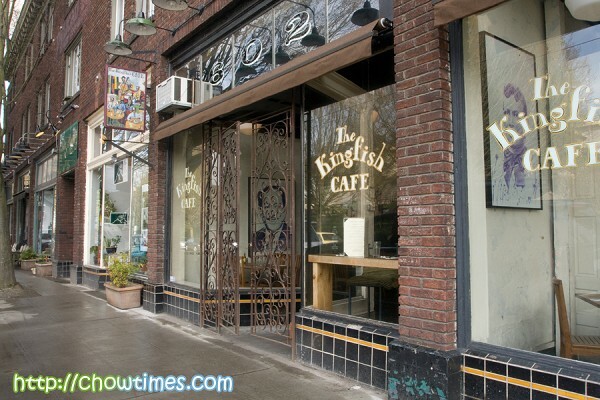 #3 is The Kingfish Cafe and it is Southern and Soul food … which is exactly what I wanted Suanne to try. I had quite a bit of Southern and Soul food in my travels to Atlanta and New York but not Suanne. 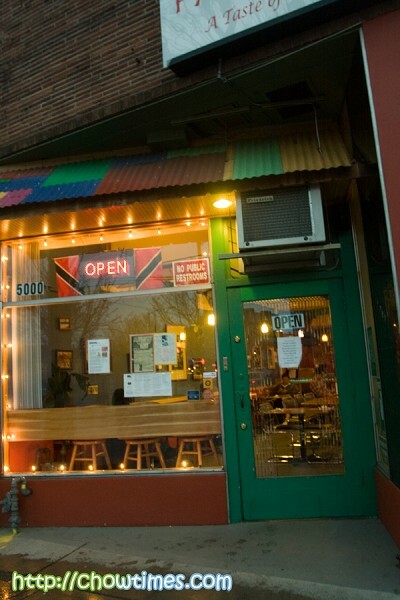 The Kingfish Cafe is located at the Capitol Hill area. Their address is 602 19th Ave E. We were there about 15 minutes before their opening time and found there were two ladies who were also there waiting for them to open. The two ladies who looked like they are also from out of town told us that they had been waiting for the past hour! This place must be that good, we told ourselves. 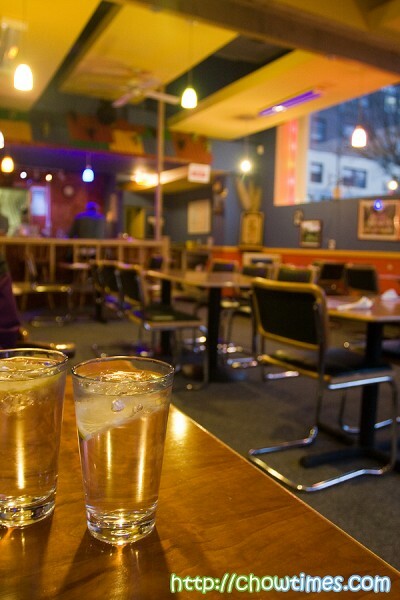 The Kingfish cafe is very much a neighborhood cafe. Plastered all over the front windows are decals from almost every restaurant review organizations that we could find. Their kitchen is open. We decided to get a seat by the window and could not see the action from where we were seated. We also noted that most of their customers were black which tells us that this is the right place for soul & southern food. Suanne choose a dish called Mary Mac’s Fried Chicken Salad. This one is $12. The reason I suggested this was the word Mary Mac. I had dined at the Mary Mac’s Tea Room in Atlanta once and it was one of the most memorable meal I had. Mary Mac’s is world famous for being one of the best in Southern cooking. 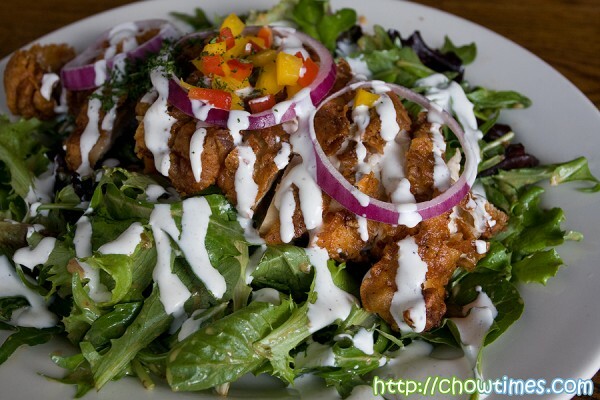 This dish has a whole marinated chicken breast fried up crispy with fresh wild greens and a buttermilk jerk dressing. Served in a very large plate, it really made our eyes open wide when it came. It is perhaps one of the most good looking and appetizing salad we had ever seen.